In Death Squared you work for tech company that specializes in A.I. robots. Your task it to guide a group of small A.I. robots around various testing chambers trying to get each robot to it’s appropriate finish space. Standing in your way of reaching the finish spaces are many obstacles which include lasers, spikes, switches, teleporters, and pits. To have any chance of success the robots must work together activating switches, blocking lasers and even acting as platforms for other robots. One of the first words that I would use to describe Death Squared is simple. The puzzles themselves aren’t simple (for the most part) but the gameplay is. The only controls in the entire game are the controls to move the robots around the stage. Death Squared is the type of game that you can pick up and immediately know how to play it. Being designed as a party/multiplayer puzzle game this works quite well since Death Squared is a game that you could play with people who rarely if ever play video games. At this point Death Squared might sound like a lot of other puzzle games. While I really enjoyed Death Squared I have to say that the game does suffer a little in the originality department. While the game does a great job using the mechanics that it has, I wouldn’t say that any of the mechanics in the game are highly original. The basic mechanics of using several characters to solve puzzles has been used in quite a few other puzzle games. If you have played a decent amount of puzzle games I don’t think you will find anything in the gameplay department that you haven’t seen in another game. While Death Squared is a little lacking in original mechanics, it makes up for it in basically every other way. While the game’s mechanics may not be highly original, Death Squared does such a good job using its’ mechanics to create a fun engaging experience. Where the game really succeeds is with the puzzle design. The only thing you can do in Death Squared is move characters around but the game comes up with so many different ways to use that mechanic to create interesting puzzles. You have to hit switches to open up new paths, use robots as shields for other robots, and you even have to use robots as platforms for other robots. 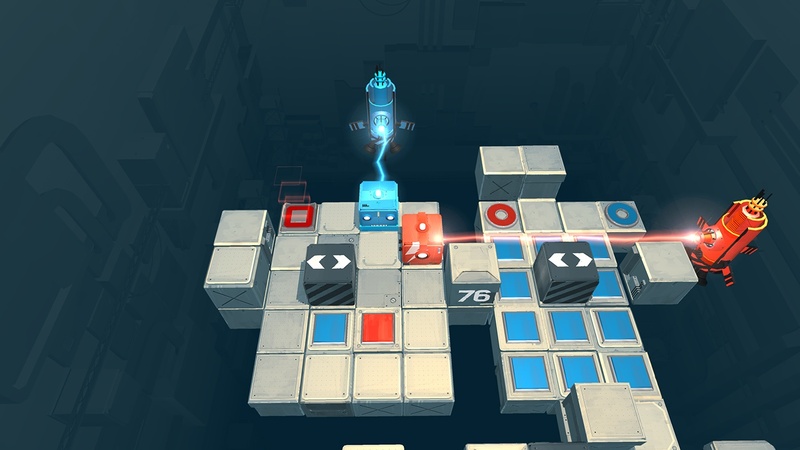 The game introduces new ways to use the robots and then does a good job of mixing and matching these options to create puzzles that don’t feel stale. So one of the biggest questions for most puzzle games is how difficult are the puzzles. I would probably classify Death Squared as a moderately difficult game. The game has some really straightforward puzzles but then there are some puzzles that really make you think. The game gets more difficult the further you get in the game but it increases at a comfortable rate. The difficulty is a little up and down though as you can run into a puzzle that takes you a while to figure out but you will then run into a couple of puzzles that you will breeze through. While some of the puzzles may seem difficult at first, each puzzle has a logical solution that you will eventually figure out. Death Squared does a good job of balancing the challenge so it isn’t too easy or frustratingly difficult. I have spent most of my time with Death Squared in the story mode. In the story mode you follow David and his A.I. computer assistant Iris who work for a tech company in the future. David’s job is basically to oversee the A.I. robot tests. I would say that David probably shouldn’t be considered a model employee. Through the conversations between David and Iris you find out more about the company that David works for. While I am not going to say anything else about the story to avoid spoilers, I have to say that I was actually quite surprised by it. While I love the puzzle genre, the genre has never been great in the story telling department. The thing I was most surprised about Death Squared was that it is actually quite funny. The humor probably won’t appeal to everyone but I found the game to be quite funny. While I haven’t spent a lot of time with the multiplayer aspects of the game, it might be the best part of the game if you can find other people to play the game with you. While you could play the story mode by yourself, the game gives you the option of playing it with another player. Working with another player is a fun experience since the game requires quite a bit of coordination. Players need to work well together in order to succeed in the game. While the game could lead to some arguments if players can’t work together, the game can really shine if the players work well together. As far as length you should get quite a bit out of Death Squared. The story mode has 80 puzzles. Some of these puzzles you can solve really quickly while others can take you some time to figure out. I would say that the story mode would probably take most people around 6-8 hours to complete depending on how quickly you can solve the puzzles. In addition to the story mode the game also has a party mode and a vault mode which adds quite a few puzzles for two and four players. I haven’t been able to play these modes yet but I would guess that they would add quite a few more hours to the game. Overall I really enjoyed Death Squared. While it doesn’t really have any highly unique mechanics, it does a great job using what it has. The puzzle design is well done being challenging enough to keep you interested while avoiding becoming frustrating. The game also has a lot of polish and has a surprisingly good story for a puzzle game. If you don’t like puzzle games in general or this type of puzzle game, Death Squared probably won’t be for you. If you like this type of puzzle game though, I think you could really enjoy your time with Death Squared. We at Geeky Hobbies would like to thank SMG Studio for the review copy of Death Squared used for this review. Other than receiving a free copy of the game to review, we at Geeky Hobbies received no other compensation for this review. Great puzzle design with the right amount of difficulty. Surprisingly good story for a puzzle game. Doesn't really have any unique gameplay mechanics.